The morning minyan at the 2016 New York City Marathon. 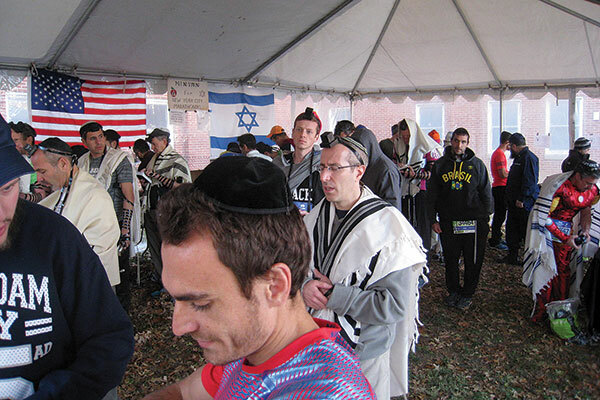 At 7 a.m., in a tent at the staging ground of the 2016 New York City Marathon, Peter Berkowsky of Livingston was leading the morning minyan, something he has been doing since 1983. About 30 people were davening with him. Remembering how he got started, Berkowsky, 74, “was really into running in those days, and was planning on trying the Marathon in ’83,” he wrote in an e-mail to NJJN. He had also just finished saying Kaddish for his mother and thought there might be runners saying the mourners’ prayer. So he organized a minyan and has been running it ever since. He said one thing was surprising: “Over the years, of the thousands of runners from six continents and virtually every state in the union who have joined us, very few are saying Kaddish. These are just runners who want to daven in a minyan before running a marathon,” he wrote. This year, participants included people from around the United States as well as Canada, Israel, the UK, Venezuela, Paraguay, Argentina, Brazil, South Africa, and Australia. The 7 a.m. minyan was the first of four “rolling” minyans that morning, which concluded by 11:30 a.m.
Berkowsky claims it is the longest-standing religious service of any kind at any sporting event, anywhere in the world. Although not too many women participated this year, the minyan has served as a matchmaker of sorts. One couple who met at a minyan three years ago had planned to run this year — until their plans changed last Thursday, when their third child was born, according to Berkowsky. Helping him coordinate for many years was Rabbi Jim Michaels, another marathoner who responded to Berkowsky’s call for participants that first year; Michaels has since moved to Maryland. Berkowsky is proud of the minyan’s accomplishments, and even takes credit for the timing of the marathon. “It used to be held the last Sunday in October, but in 1985 (only our third year — talk about chutzpa), we approached Fred Lebow and informed him that the last Sunday in October the following year would be Simchas Torah. We somehow convinced him to move the ’86 marathon to November, where it has stayed ever since,” Berkowsky wrote. JRunners, a Brooklyn-based organization promoting physical health for Jews through athletic competition took over managing the minyan in 2010, but Berkowsky still helps coordinate logistics, although he no longer runs.